Although we had such good weather yesterday, we awoke to a grey dreary morning today- as expected of Kanazawa! It’s got a reputation for rain with 193 (!) wet days per year. Our spirits were not dampened too much though as today we planned to hire a car and drive out to the nearby Noto peninsula. First though we had our buffet breakfast at the Dormy Inn hotel, the food was good! Next we left the hotel and walked down to the JR Ekiren car rental place on the other side of Kanazawa station. We planned to rent the car for three full days, and then drop it off in Kaga-Onsen on the fourth day’s morning. We made sure book it at 0830 and return it at 0800 in order to get the car for a cheaper rate (as the final day wasn’t a full 24hours)- 16,990 yen total. Although we’ve successfully used Tocoo in the past to rent cars, this time we booked directly through the completely Japanese Ekiren website. We either did this because Tocoo didn’t have any cars available on the days we wanted or because it was cheaper. Unless you’re confident in your Japanese abilities, I would definitely recommend sticking with Tocoo though as using the Japanese car rental websites is a little confusing. Also, as we were staying in Kanazawa again tonight I made sure when we checked in to mention that we’d be hiring a car today. Right. So after breakfast we walked all the way down to the car rental place, and then I jogged all the way back to our hotel as I had forgotten my international drivers licence. Once I’d finally returned we went into the outlet and sorted out things with the staff inside. Basically, everything gets scanned (Licence, Passport, International Licence) and we’re reminded to fill up with petrol upon return. We also declined the additional insurance (covering the excess) as our travel insurance already includes that. Next we went outside and double checked the condition of the car (a Nissan) with an attendant and signed the sheet confirming as much. I think he also turned on the Petrol Stations display on the GPS. Oh and Kate got some great maps and pamphlets from their office! After hopping in we, as always, left the outlet too quickly and therefore got lost in the backstreets, eventually though we found our way and followed a little river through the countryside on the outskirts of Kanazawa. After a few dozen kilometres we reached the start of the peninsula and the free expressway which was formally a toll road. The Noto Peninsula extends about one hundred kilometres into the Sea of Japan and is known for its coastal scenery and rural atmosphere. It’s a reasonably skinny peninsula and most of the sights are located on the coast- our plan was basically to do a clockwise loop around the island, stopping to visit the sights along the way. The first stop was Chirihama Beach. Well it wasn’t technically a stop as the attraction is the opportunity to drive your car along an eight kilometre stretch of sand. Now, as we’re both from Queensland, Australia there probably are not too many beaches in the world that would impress us (the east coast of Australia is about 3,180kms full of perfect beaches). Chirihama was not one of them. Honestly it seemed pretty dirty to us, not just the sand but there was even little bits of rubbish about the place, which was surprising as we almost never see rubbish in Japan as people are very good at picking up after themselves. It looked like it has washed ashore. Our impressions of the beach were probably not helped by the rain, and it’s probably not the pinnacle of the area considering you can drive on it. It was though a lot of fun driving on the sand, and we made sure to swap drivers so we could both have a go. Apart from the other cars driving along there were a few beach huts and a section cordoned off contained some enthusiastic people who were swimming or surfing. As I’d driven most of the way so far, at the end of the beach Kate took over driving. Our next stop was the Keta Taisha Shrine, which has a history of over 2000 years and is these days popular with young women as it enshrines Okuninushi, who is a god of finding true love. One of the things to do at Shinto shrines is to write a wish on an ema (wooden block), which are displayed publically. It was fun reading all the wishes for love as well as happiness and success for the people pursued. After Keta Taisha, we continued on to nearby Myojoji Temple. As we approached we could see the temple’s noted 35 metre tall, five stored pagoda poking out about a clump of trees in the distance. As we got closer we found that the streets leading to the temple were very narrow, and we were very glad that we didn’t encounter any cars coming the other way. Myojoji is quite an old temple, founded in 1294. The pagoda dates from 1618 and the oldest building was built around a few decades earlier in 1593. Although it was raining quite a bit, we had a look around the grounds while Kate gave me a tour. I think I remember one of the interesting points about the architecture of the buildings is that the traditional roofs are slanted and are noted for having small tiles. Seeing the Pagoda up close was really cool too! We tried not to linger for too long, as apart from the teeming rain there were also a fair number of mosquitoes about. After returning to the car we continued along the coast (past a nuclear power plant and some wind turbines) to Ganmon Rock, which is part of the Noto Kongo Coast. This fourteen kilometre stretch of coastline is particularly exposed on the western fringe of the peninsula, which has resulted in some dramatic rugged features. The most popular area contains the Ganmon or “Gate Rock” which is basically a hole that has been eroded through a little cape. Although there were not too many people around today, we did find a big carpark and information centre in the vicinity. It’s possible to go on a boat tour out to the rock and some other formations in the area, however as Ganmon rock can be easily seen from the coast, we opted to just walk down the path ourselves. From the coast we had a great view of the hole, and we could actually walk through another coastal hole ourselves (a cave) and come back up the cliff via some walking paths on the other side. The trails around here were quite steep, and you need to go down and up a decent amount of stairs from the carpark level. Apart from us there was one other couple exploring around, and Kate took a photo of them in front of the hole. Back up on ground level we found a few different stores and contemplated getting lunch as we were quite hungry. We ended up passing on that though as there wasn’t many appealing options available. 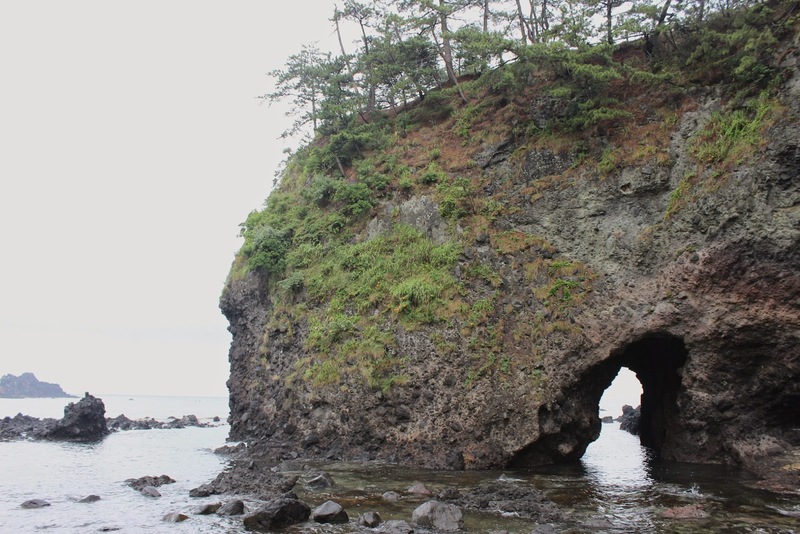 Our next stop along the coast was the Hatago Iwa, which are two sacred rocks connected by Shimenawa rope (used to mark the presence of spirits). As the rocks look like the famous ones in Futami, Ise they’re referred to as Noto Futami. While we were enjoying the view a group of old Japanese men came over, talked to us, and took our picture. They asked where we were from and what direction we were travelling in, which turned out to be opposite of their direction, though we were nowhere near half way around. I talked to them in Japanese about some other things, but I can’t remember what we discussed now. As it was raining a fair bit we got worried when one of the men took our photo as the camera got pretty wet. This caused one of the dudes to pull out his hanky to wipe it down! What’s it with old men and hanky’s!!? On account of the time and rain, we decided to skip Sojiji temple and continued on through Wajima city to the Senmaida Rice fields. About half way along we stopped at a convenience store for a much needed lunch. I had a rice/assorted fried meat pack and Kate had some Edamame beans. Senmaida means a thousand rice fields, and actually understates the number as there are in fact over 2000 tiny rice fields located on a terraced hill that continues all the way down to the water’s edge. The rainy day actually helped enhance the experience and the view of the rice fields was the prettiest we saw on the Noto Peninsula- a definite highlight! In fact the fields have been designated as a national site of extraordinary scenic beauty. The view was available from a carpark and small souvenir shop that overlooked the hill, though we found it was also possible to walk down and explore many paths through the rice paddies. Everything looked very delicate, and we could see what looked to be people’s names marked on some of the fields. It was quite interesting seeing how the water was distributed between the different levels. Thanks to the weather there were not too many people around and we had the paths to ourselves. Though by the time we climbed back up one other person also walked down to have a look as well. Near the ocean we saw a lot of the slater like ligia creatures we first saw in Kyushu. Back up at the souvenir store Kate brought some peanut rice and seaweed rice crackers (Senbei), which, especially the peanut flavour, started her food obsession for this trip. We also saw some information about the fields get lit up sometimes at night. The photos of this illumination looked really pretty! Once we were finished at the rice fields we decided to make the Rokkozaki Lighthouse at the tip of the peninsula our last stop as it was nearly 5pm and we had to make our way all the way back to Kanazawa! It was actually quite a long drive to the lighthouse and by the time we parked and spent ten minutes walking up the hill it was already 6pm and very wet, rainy and windy with no one else around. It was even a little cold. We could see some shut shops, so perhaps it’s livelier at other times. I think if you’re headed around to the other side of the peninsula or are in the area it would be worth a look, but it really wasn’t that spectacular. This is quite an old lighthouse though- Meiji Era. Basically there was a bit of a Cape, a little old white lighthouse and a sign indicating we were about halfway down Japan. After a quick look we hurried back to the car and made our way all the way back to Kanazawa. About half way back along the peninsula we re-joined the expressway, which allowed us to travel faster. Though there did seem to be some sort of traffic control cars along the way who drove at a set speed in front of a line of cars. The first part of the expressway on the way back was quite interesting/scenic as the road included lots of high tunnels and bridges. As we got closer to Kanazawa the road widened and got much busier. In fact we got stuck in a traffic jam right at the end, which was annoying. Eventually we managed to make it back to our hotel, and drove our car to the parking place. This was quite exciting as it was a car elevator! What we had to do was drive the car into a little room, get out, and then the parking attendant pushed some buttons and we watched our car rotate up out of sight! For dinner, I had some Tenpura Udon at the shopping centre we had visited last night, but sadly it was too late for Kate to buy some mochi! I had a little (futile) look around for an SD card as I’d recently realised that my computer (Microsoft Surface laptop) only had a microSD card slot and therefore we were unable to backup/empty the photo’s we’d been taking! Finally, it had become late enough for our hotel to start serving the free late night ramen, which Kate had for dinner. She put way to much spice on them though so I can’t report that she enjoyed them! Eventually we finally collapsed into bed after another big day!